_ This song from the Carmina Burana celebrates the capture of Jerusalem from the Muslim Arabs by the Crusaders on 15 July 1099, which is illustrated in this picture from a medieval manuscript. This day was subsequently kept each year as a festival. The whole song is included as track 4 of the CD `Carmina Burana’ (volume 1) by the New London Consort and Philip Picket (L’Oiseau-Lyre, 417 373-2), which can be heard on-line at http://www.youtube.com/watch?v=-CWm0765jGA. In the lyrics given here medieval spellings (e.g. hec for haec) have been replaced by classical ones as these are more familiar to those learning the latter, even though the medieval orthography is a better representation of the later pronunciation. Macrons have similarly been added even though the old distinction between long and short vowels was lost at the beginning of the Middle Ages. 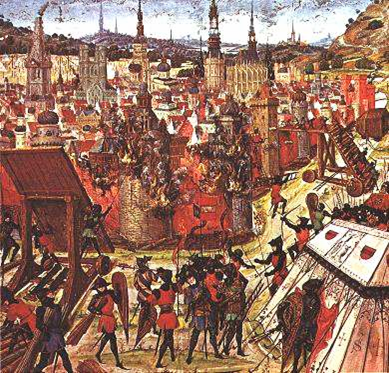 The most famous eyewitness description of the slaughter of the inhabitants of the city which followed the fall of Jerusalem can be read in the original Latin and in translation at the bottom of the page. Other accounts are available here in translation. ipse sōlus lūgeat reus apud Aeacum! let the guilty man lament alone before Aeacus! quī salvāvit urbem Dāvīd ā pāgānīs hodiē! who saved the city of David from the pagans today! diem colāmus igitur! therefore let us celebrate the day! in hāc propter hominem crucifīgi voluit in this he was willing to be crucified for mankind. hīc super apostolōs Spīritus intonuit. here the Spirit thundered above the apostles. Fēstum agitur etc. The festival is held etc. Urbs sacrāta caelitus, adamāta superīs, City sanctified in heaven, loved by those above. hospitāle pauperum et asȳlum miserīs! refuge of the poor and asylum for the wretched! nōn timēbis aliquod, dum in eā mānseris. you will not fear anything whilst you remain in her. Tantā vīcit sanctitāte omnēs urbēs haec urbs ūna. by such sanctity this one city surpasses all cities. Nōn ēlēgit frūstrā locum Gebusaeus Areūna Araunah the Jebusite did not choose the site in vain. Solemniacum: probably not a variant of `Solyma’ (one of the names for Jerusalem itself) but rather the Benedictine abbey founded in 632 by St. Eloi at Solignac near Limoges in France(see the account in French at http://www.petit-patrimoine.com/fiche-petit-patrimoine.php?id_pp=87192_10 ). 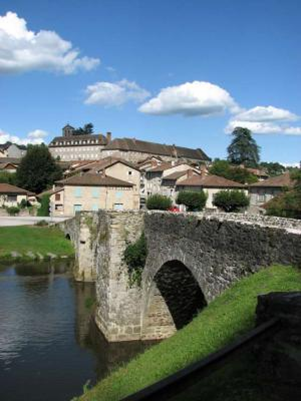 The picture shows the village with its 12th century bridge in the foreground. The name Solemniacum means `the domain of Solemnius' and refers presumably to a Gallo-Roman who owned the land and built a villa around which a village then grew up (this was a common development and explains why the word `village' itself derives ultimately from the Latin vīlla). The French website dates Solemnius's foundation to 28 B.C. _ Dāgon; Dagon was the national god of the Philistines (非利士人), enemies of the Jewish people in the Bible; here the word refers to Muslims. nātus Āgar: `son of (H)agar’; she was the concubine (妾) of Abraham (阿伯拉罕) and believed to be the ancestor of the Arabs. Amālec: name of a Bedouin tribe which repeatedly fought the Jews in the Bible. According to the Book of Samuel, Saul, who defeated them at the beginning of his reign, lost God's favour because he failed to carry out fully the divine command to kill all of them together with their animals. This episode in the Old Testament was interpreted as providing justification for the slaughter of religious enemies in subsequent centuries. ignis venit annīs singulīs: a reference to the supposedly miraculous blue fire which usually appears to descend in the Church of the Holy Sepulchre on Holy Saturday (the day before Eastern Sunday) according to the Orthodox calendar. See the account on the Holy Fire site. Areūna: more usually spelled `Araunah’, this refers to the man from whom David bought a threshing floor to set up an altar on the site where he founded the city of Jerusalem and where Solomon later built the temple. Gebusaeus is normally transliterated ` Jebusite’ in English and presumably refers to an ethnic group which lived in the Jerusalem area before the Jews conquered it. diximus. Sed ad Templum Salomonis veniamus, ubi suos ritus atque solemnitates cantare solebant. Sed quid ibi factum est? Si verum dicimus, fidem excedimus.Sed tantum hoc dixisse sufficiat quod in templo et in porticu Salomonis, equitabatur in sanguine usque ad genua, et usque ad frenos equorum iusto miroque Dei iudicio, ut locus idem eorum sanguinem exciperet, quorum blasphemias in Deum tam longo tempore pertulerat. Repleta itaque cadaveribus et sanguine civitate, confugerunt aliquanti ad turrem David, et poposcerunt a comite Raimundo securitatis dextram, et reddiderunt ei arcem."